Chuga-chuga-chuga-chuga. As a pregnant mom-to-be, the sound of a baby's heartbeat becomes familiar and reassuring with every doctor’s appointment. The first time you hear it, its sounds so odd – too fast to be a heartbeat. But with each appointment, you get to the point where that little chuga-chuga is the most beautiful sound in the world. Heartbeats, both big and small, have been on my mind all week this week. My heart broke this week as we learned news about our friends, Brad and Lisa. They welcomed little Field into the world on June 14. Soon after his arrival, they learned that Field has a congenital heart defect and will undergo a series of three surgeries - the first at 4 weeks, the second at 6 months and the third at three years of age – to reposition the arteries in his heart. Field has been in the NICU at Methodist Hospital all week but was welcomed home late yesterday afternoon. He is a beautiful little boy and the faith, determination and strength that his parents have shown have been an incredible lesson to me. What a special friends for our family to have! The Nugget and Field are sure to be friends and will know what a miracle their lives are by the scars they will bare. I ask that you keep the Johnson's in your prayers as they prepare for Field’s first surgery. On the Nugget front, I am now seeing the perinatologist once a week to monitor her progress. We had a growth measurement test on Monday and she’s still measuring small – now in the 13th percentile. As I’ve said before, these measurements are based on her abdominal size so aren’t necessarily true to her actual size. During the ultrasound, Dr. Higby (Dr. Gordon’s partner) seemed to focus an abnormal amount of time on her heart, checking and rechecking. Chuga-chuga-chuga-chuga. As we’ve now confirmed, Nug’s heart is growing in size and is about 60% of the size of her abdomen (remember, this is a small abdomen). Since the blood flow to her liver and other organs is abnormal, her heart is pumping extra hard to get blood to the necessary areas. This extra work is causing her heart to enlarge. If the heart continues to grow and continues to pump excessively, this could lead to heart failure. We will continue to monitor her heart closely and, should they detect heart failure, will need to deliver early. Each doctor keeps telling me, the main goal is to get me as far along in this pregnancy as possible. With an omphalocele this large, early delivery could be harmful as we’d add extra problems to the Nugget’s list. My heart is hoping that we make it to August 4 and that this little baby stays tucked in my belly until she is as cooked as she’s going to get. Please pray for that sweet, little chuga-chuga and that God develops her heart to be strong and viable. 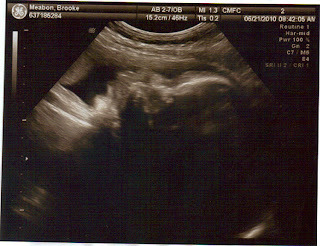 Now Nuggalicious and I had a little discussion before the ultrasound started. We talked about her stage presence as the cameras begin to roll and, low and behold, I think our little mother-daughter chat worked. 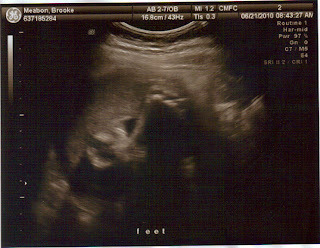 I’ve included a few of the pictures from her time on camera, one of her profile and the other of her foot. Can you make out those precious little details? I must say, I think she’s beautiful…but maybe I’m a little biased. We were happy to have Dad and Julia and my little brothers, Parke and Nathan, come for a visit this last weekend. I can’t believe Parke and Nathan are getting so big! As a four and five year old, they are full of energy and are looking forward to the arrival of their niece. We head to Lake LBJ today to spend time with the entire Boswell clan. Summer lake trips have been a constant in my life and one of my favorite parts of summer. We look forward to this weekend each year and will relax, laugh and have fun with all of the extended family. Its hard to believe we’ll be adding another body to the growing family this time next year! But rest assured, I will take it easy - no boating or jet skiing for me. Once again, the pregnant lady will continue to float. We continue to be comforted by your emails, calls, texts, prayers and positive thoughts. We are constantly amazed by the strength of our support system out there and are thankful for each and every one of you. I hope you are all having a wonderful summer! Hello you precious little Nugget. 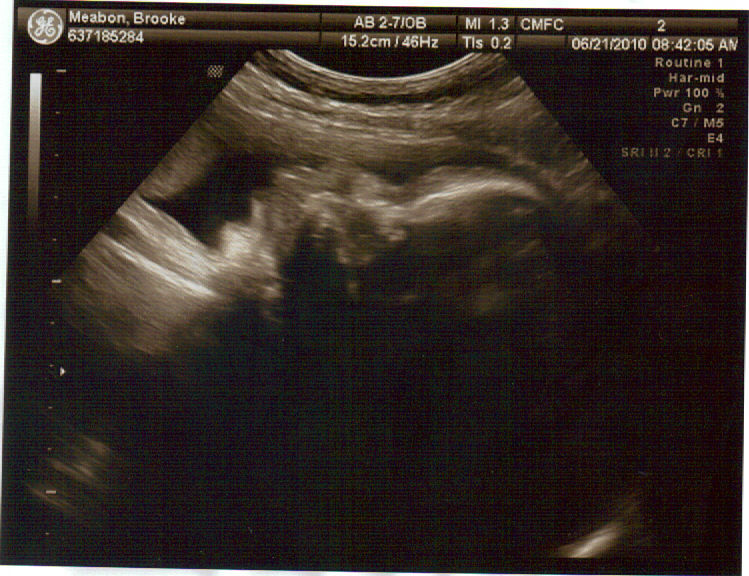 So fun to see you, as much as I can tell from these sonograms. Cute little foot you have there. There are lots of shoes out here you're going to love. :)Along with lots of people that are praying for you and you are going to be in one of the most wonderful families I know. You are so loved already Nugget. You keep growing while your mommy keeps floating.